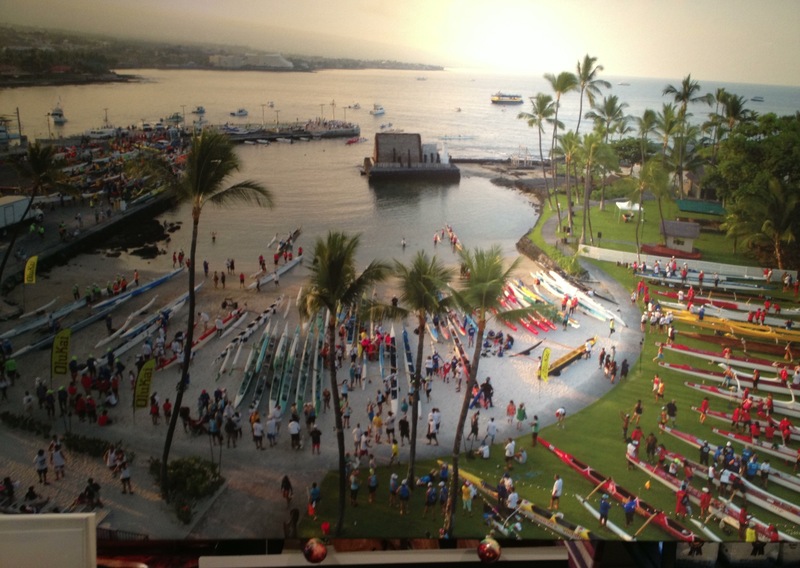 An outrigger canoe is defined as a traditional canoe that includes in its design, a rig that extends laterally outwards and supports a flotation device. This flotation device gives the canoe the stability necessary to travel over great distances and in a variety of water conditions. The flotation device (known as an ama) is supported by two spars (knows as iako) that are lashed across the gunwales of the canoe and extend outwards, usually to the left. Many variations of these designs exist depending on water conditions. As with most modern canoe clubs, False Creek focuses on the single ama fibreglass design racing canoes. We compete in single, double, and six person races in both fresh and salt water. Race styles vary greatly in this sport. Some sprint races can be as short as 500 meters while long distance change races (where paddlers rotate in and out of the boat) can be up to 45 km in length or even longer and last for 6 – 8 hours. The development of outrigger canoes is difficult to trace back because they have been in use far longer than there have been written records. A common estimate is that the development of outrigger canoes dates back nearly 3000 years. As a result, most of what we call ‘history’ is based largely on conjecture. It is assumed that that the first designs for the canoe were formed from logs hollowed out by the use of clam shells or perhaps sharpened rocks. The limited stability of these water craft then led to the Polynesian practice of lashing two canoes together to form a double hull design. It is assumed that out of the double hull design, the next logical advancement was the double outrigger design which offered increased manoeuvrability and stability. Though very fast, the problem with the double outrigger design was that in heavy seas, the primary hull could become suspended between two large waves which made manoeuvring impossible and often lead to snapping of the iakos. The single outrigger design overcame this limitation and has persisted over the years as being the optimal compromise between stability and flexibility. JD Boswyk 1994 Calmar White Named after a popular FCRCC club member who died in the 8.1 magnitude earthquake which struck Mexico City in 1985. Hokupa'a 2003 Mirage White Our first Mirage and the first in Canada. The name means "North Star". Kai Hohonu 2004 Mirage White The name means "Depth", as in "depth of the ocean", but also signifies our committment to the depth of our programs - so that more than just our top-crew paddlers can train in a competitive international hull. This boat is traditionally reserved for second crews. Ku Kanaka 2007 Mirage White "Ku" is defined as something deliberate and of great force; it is also the name of one of the Hawaiian gods from the days of old. Ku is a word you would hear quite often in chants, to achieve great strength and drive for the purpose. There is a dual meaning of the word "Kanaka", as many Hawaiian words usually do have. This word means "Canadian" – but it also means Hawaiian man, or Hawaiian person. This canoe, built in 2005, was bought in 2007 from the Westbay Club in Victoria.